HAMATAWHAT? Hamantaschen! 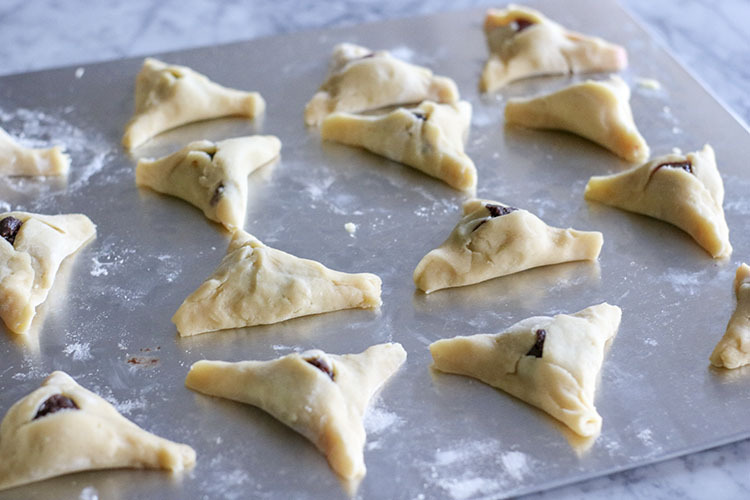 What are hamantaschen? 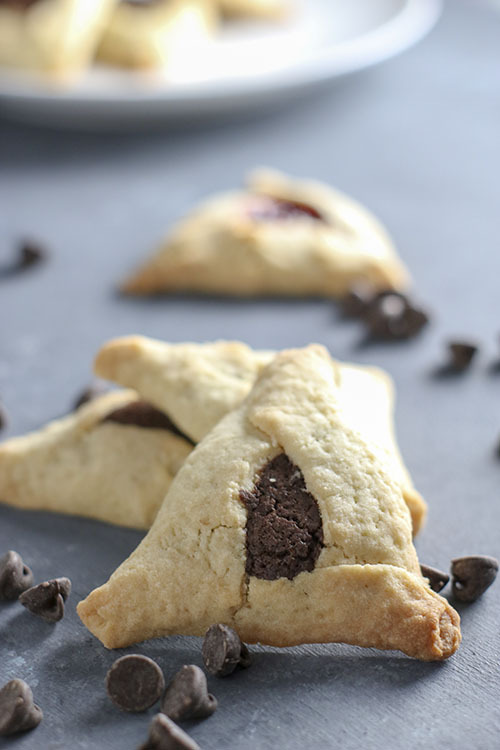 Hamantaschen are a triangle shaped cookie often associated with the Jewish holiday of Purim. There are many different theories as to where the cookies came from or why they are named as they are – all I know is that they are delicious! Idea #2: Cookies represent “Haman’s ears” because there was a custom of cutting off a criminal’s ears before his execution – eek! Who knew a cookie could have so much meaning? Strange. ANYWAY, moving on! To the cookie – NOM NOM NOM! 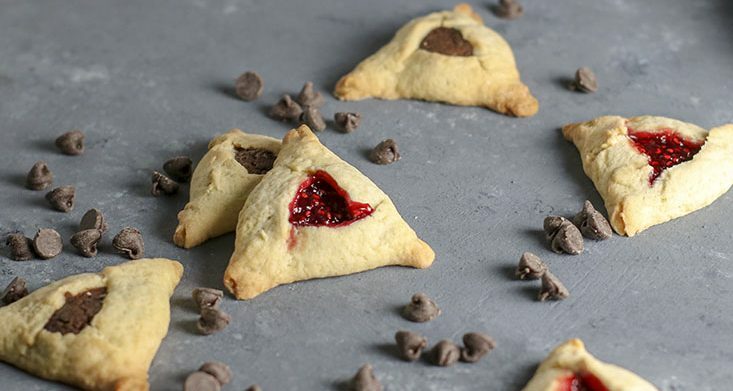 My mom used to always make hamantaschen for us when we were young with all sorts of flavors – raspberry, apricot, poppy seed – I want to say she even sometimes made some with prune? But perhaps I am making that up. Regardless, I never ate ANY of those gross flavors because I had something better – chocolate. 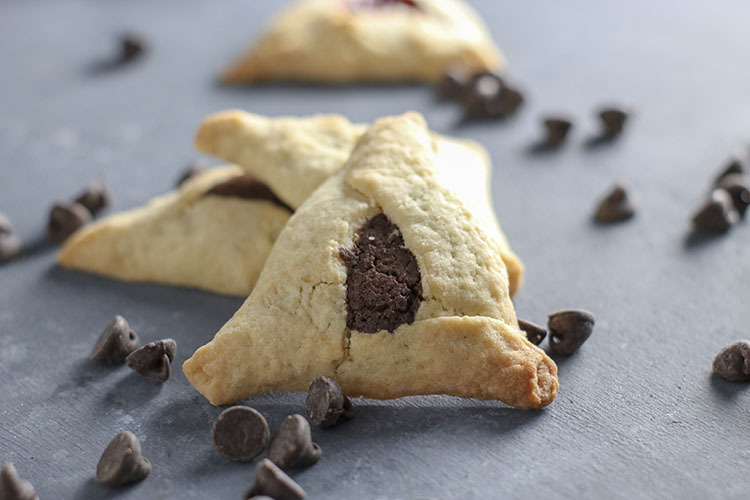 My mom would specially make me hamantaschen with chocolate chips that were the best. 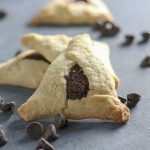 Until making hamantaschen on my own for this very post, I honestly thought that chocolate hamantaschen were the only kind that I liked! However, I decided to try a few with raspberry preserves as well – dare I say, I might like them better than chocolate! What has happened to my taste buds!? Are they maturing? Strange. This time around I decided to step it up a bit with the chocolate chips. Rather than just making plan ol’ hamantaschen like we used to with simple chocolate chips, I tried out a new chocolate/ganache type cookie center :). 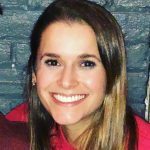 You will have to let me know what you think! As mentioned above, you might find a recipe for hamantaschen using butter, oil, or cream cheese! All are correct – all make the final result a little bit different. Cookies made with butter will be more dense and buttery (surprise); cookies made with oil will have a crumble; cookies made with cream cheese will be fluffy and soft. I love to make my hamantaschen with butter because they end up so rich and delicious. Almost like the texture of a shortbread – but with tucked away a pocket of flavorful goodness. Perfect with a cup of tea, coffee, or milk! 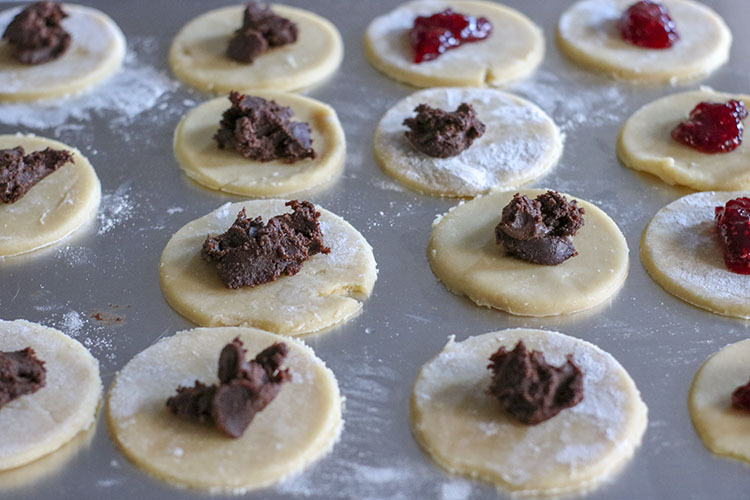 A dense, buttery triangle-shaped cookie filled with sweet chocolate or fruit preserves. Baked to perfection. Best enjoyed with coffee, tea, or milk! In the bowl of an electric mixer, add butter and sugar (for easier mixing: slice butter into 1/2-inch squares before adding to mixer). Beat until light and fluffy, use a spatula to scrape down the sides of the bowl. With the mixer on low, beat in egg and vanilla until ingredients are fully combined. Slowly add flour and salt to mixer, scraping down the sides of bowl as necessary. Add water, if needed. Scrape the dough onto a lightly floured surface, then knead dough with clean hands until smooth. Divide dough in half to form two small discs, about 1-2 inches thick. Wrap with plastic wrap and refrigerate a few hours or overnight, until firm. If you are crunched for time, freeze for approximately 30 minutes, or until firm. Place butter in a medium-sized microwave safe bowl. Cover with piece of paper towel (to prevent splattering), then microwave on high until melted (about 1 minute). Add chopped chocolate to melted butter and stir until smooth. If necessary, microwave the butter/chocolate mixture for additional 20 second intervals if chocolate will not melt on its own. Stir in the sugar, vanilla, and salt (the mixture may appear grainy at first, that's okay). Add egg and whisk until fully incorporated. Stir in flour and beat until smooth (at least 30 seconds) - cover and refrigerate until ready for use! Preheat oven to 350F. Line a cookie sheet with parchment paper (or lightly spray with oil), then set aside. Remove one disc of dough from fridge or freezer (if using freezer, move second disc of dough to fridge). Allow dough to sit at room temperature for a few minutes, or until it becomes supple enough to roll. Place dough onto a lightly floured surface and use clean hands to knead a few times. Use a rolling pin to roll dough out to 1/4 inch thick. As you roll, small cracks may form - repair any large cracks by massaging dough back together with fingers. 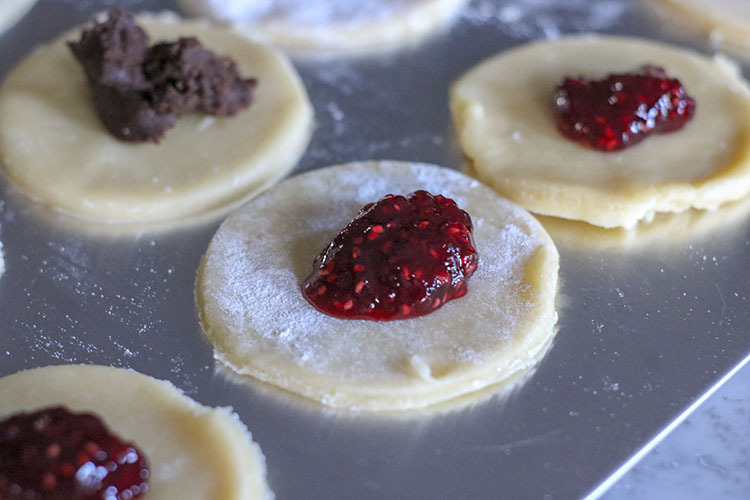 Use a 3-inch circle cookie cutter, or small water glass, to cut out as many circles as possible. Re-roll remaining dough and make additional cutouts until all dough has been used. Place cookie cutouts onto cookie sheet, 1-2 inches apart. 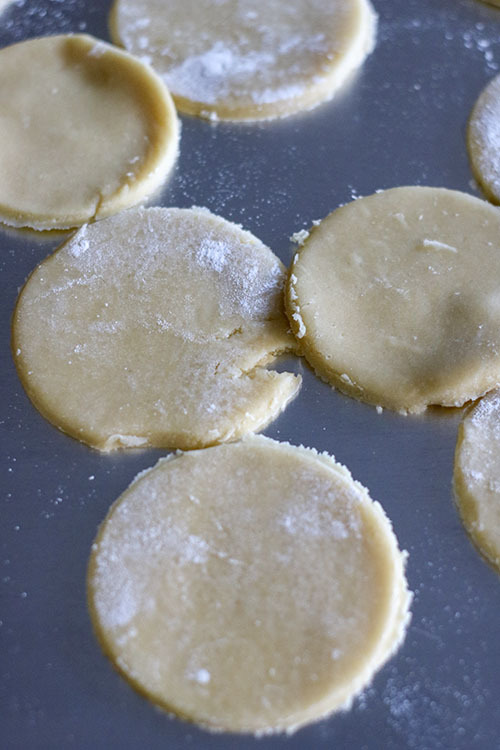 Scoop one teaspoon of filling (of your choice) onto each cookie cutout. Take the left side of the circle and fold it towards the center to make a flap that covers the left third of the circle. Fold the the right side of the circle towards the center as well, overlapping the upper part of the left side flap to create a triangular tip at the top of the circle. Take the bottom part of the circle and fold it upward towards center, leaving only a small triangle of filling still visible. Tuck the left side of this new flap underneath the left side of the triangle while letting the right side of this new flap overlap the right side of the triangle. This way, each side of your triangle has a corner that folds over and a corner that folds under, creating a "pinwheel" effect. This will help to keep cookies from opening while baking in the oven. Once all hamantaschen have been folded, bake at 350F for 20-25 minutes or until cookie edges become golden brown. Remove from oven and allow to cool slightly on pan before moving to a wire rack to cool completely. Enjoy at room temperature with coffee, tea, or milk! Storage: Store in an airtight container at room temperature for up to one week. Or freeze for 3-4 weeks. Note: These recipe instructions were adapted from a recipe by Tori Avey. Note: The instructions in this recipe were adapted from the instructions in a recipe by Tori Avey.